Get ready for WWDC 2017. Apple’s 2017 Worldwide Developers Conference is set to kick off in just a few short hours, and rumors indicate we could be in for the iPhone-maker’s most action-packed keynote in years. Not only is Apple expected to unveil iOS 11, macOS 10.13, tvOS 11 and watchOS 4, but today’s event could also showcase some fresh new hardware. Cult of Mac will be here to liveblog all the festivities with up-to-the-minute analysis on all the new software, hardware and more. Tim Cook and company take the stage today at 10 a.m. Pacific in San Jose, California, but we’ll be kicking off the fun a little early. Come join the action! At nearly 2.5 hours this has been Apple’s longest keynote in recent memory. Developers can now go and test all the new software and hardware. 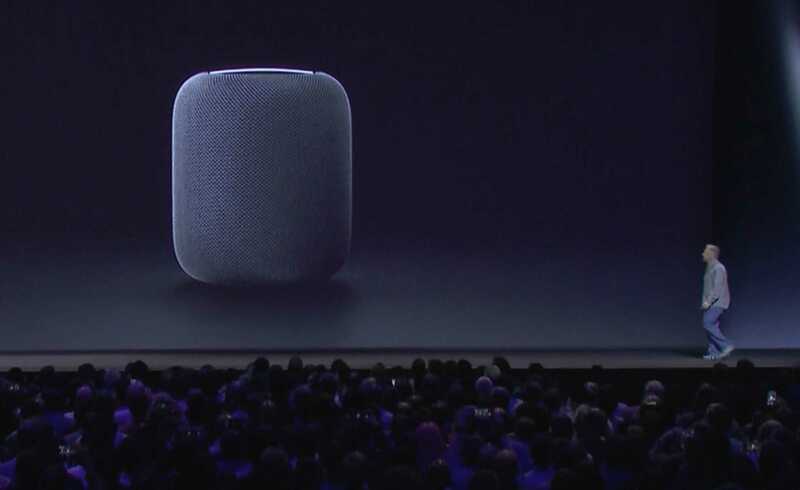 Apple’s “breakthrough” home speaker will be priced at $349. with two color options: black and white. HomePod will ship in December first in the U.S., U.K., and Australia. If you have HomeKit devices installed in your house, you can use HomePod to control appliance and perform certain tasks. Once you set up a HomePod, you can then control your HomeKit devices remotely. A six-microphone array is used for voice input, allowing you to speak to the HomePod from across the room, even if music is playing. There’s a glowing light on the top, but no screen for a visual interface, everything is done through Siri. The new HomePod speaker can be paired with other HomePods to create amazing house speaker systems. It works with Apple Music to serve up the songs you love. HomePod has to be Apple’s worst product name in years. HomePod packs an A8 processor, making it the smartest speaker on the market. Thanks to spatial awareness tech, HomePod can detect what type of room you’re in and then adapt its sound output so that music sounds perfect in the room. Apple says it’s ready to reinvent home music. Here comes Phil to tell us about it. iOS 11 is available to all developers today. It will be available to the public this fall. Handwriting is now searchable. Inline drawing is an option when creating notes. When you’re using the Notes app and lock your device, a quick tap on the screen with Apple Pencil will take you directly into the Notes app. Apple Pencil is being updated too so that it’s more integrated into iOS 11. The new Files app is just what the iPad needs to be a true PC-replacement. iOS 11 comes with a new app called Files that brings together all the files on your iPad. It supports all sorts of different organization methods. It even supports third-party apps like Dropbox and Google Drive. App Switcher has been updated to give users and quick view of what’s happening in the most popular apps. Drag and Drop has also been added across the system. There’s a new Dock at the bottom that makes it easy to switch between apps and multi-task. Simply swipe up to reveal your apps, then you can move an app into Slide Over or Split View. Memory is being double. Both sizes start with 64GB of storage. The 10.5-inch model will start at $649. The bigger iPad Pro starts at $799. All models are available with an LTE option for extra. You can order the new iPad Pros are available for order today. Units should ship later this year. The new iPads feature 10 hour battery life and the same camera sensor found on the iPhone 7 (sorry, no dual-lens camera here.) The front-facing camera is 7MP and has auto image stabilization. IT also supports USB 3 file transfers and faster charging. Now we’re getting a demo of the powerful new iPad Pro in action using a photo editing app that puts Photoshop-like tools right on the tablet. The new iPads are powered by an A10X chip with a six-core CPU and 12-core GPU, bringing 30% faster CPU performance over the A9X chip on the last models. ProMotion also lets the iPad Pro adjust its refresh rate dynamically so you can use a slower rate in certain situations to save on battery life. Both iPad Pro sizes are getting new displays with True Tone and are 50% brighter with 600 nits of brightness. HDR Video is supported. There’s also a new feature called ProMotion that increases the display refresh rate from 60Hz to 120Hz so videos look super smooth. The new iPad Pro has a full-sized on screen keyboard and Smart Keyboard attachment that supports up to 30 languages. It’s a new 10.5-inch iPad Pro with slimmer bezels. It’s 20% smaller than the 9.7-inch iPad Pro and weighs less than 1 pound. Apple is ready to introduce a new iPad Pro. That’s it for iOS 11, so it’s back to Tim Cook. Apple is making some iOS 11 improvements for users in China, like QR code reading from the lock screen. Coull promises an AR experience in the App Store later this year. ARKit is basically giving us Microsoft HoloLens capabilities, except you don’t need a pricey headset — you just use the iOS device you already own. Walking around with an iPad Pro in front of your face to play a game looks pretty goofy though. Coull is demonstrating a 3D game that puts gameplay in the real world. Using AR, you can move in for a closer look as spaceships fly over your head. It’s incredibly cool! ARKit looks amazing. Will be cool to see how quickly developers start adopting it for their apps. The demo of Craig putting a coffee cup and lamp on a table wasn’t that impressive, but Wingnut AR looks so cool! Apple is now showcasing Wingnut AR from director Peter Jackson. Alasdair Coull from Wingnut is up to show us more. ARKit will make Pokemon GO even more realistic by putting our favorite pocket monsters right in front of us. Hundreds of millions of iPhone and iPads are already ready for ARKit, Federighi says, which means iOS will become the largest AR platform in the world overnight (when iOS 11) lands. ARKit provides fast and stable motion tracking using your iPhone’s camera and sensors. It can identify plane estimation and basic boundaries, ambient light, and lots more. “We have a new core technology called ARKit,” Federighi says. It will allow developers to deliver all kinds of awesome augmented reality features to their apps and games. Federighi is developing a simple app that lets you insert objects into the real world with your iPhone. Federighi is now talking augmented reality! Oooh! Developers will have access to new APIs that allow them to incorporate machine learning into their own apps. Metal 2 is also coming to iOS 11 — alongside new machine learning features. That’s it for the App Store. Federighi is back up! The App Store will also offer “let’s play” videos. 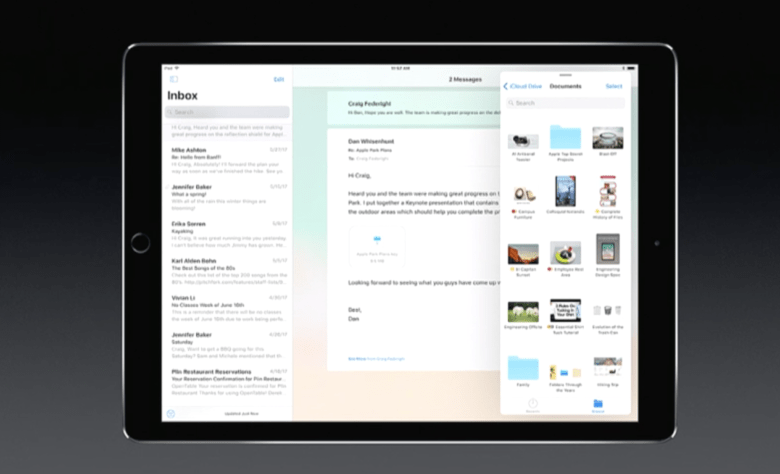 You’ll be able to see previews as well as tips from Apple and developers. Every day there’s a new App of the Day, a Game of the Day, and a themed Daily List. If you miss a day, you’ll be able to scroll down to see previous collections. Developers will be able to tell us more about their titles and offer how-to guides that help us get the most out of their apps. We’re now getting a demo of the App Store’s new interface. App product pages are also prettier than ever before, with new features like the ability to display awards and more. A new “Today” tab will highlight new titles that have just hit the App Store, and those promoted by Apple. Games now have a dedicated tab where you’ll find the latest and greatest titles, and for the first time, Apple will be promoting in-app purchases when new content drops. Apple is also completely redesigning the App Store for iOS. It’s “absolutely beautiful,” Schiller says. Apple has a lot of improvements for developers coming later this year. One of those is phased releases, which lets developers choose to rollout to users over time — rather than all at once. The App Store has now served up over 180 billion apps to date, with over $70 billion paid out to developers. 30 percent of that was paid in the last year alone! Are they finally fixing the App Store? “One of the biggest stories for iOS 11 is with the App Store,” Federighi says. Phil Schiller is up to tell us more. Apple Music in iOS 11 will show you what you’re friends are listening to, and you’ll be able to configure your own profile to specify what you share. Federighi is now talking us through the improvements to Apple Music, which now boasts over 27 million paid subscribers. Apple has a bunch of speaker manufacturers on board for AirPlay 2, and any speaker connected to Apple TV will automatically have AirPlay 2 support. HomeKit is getting support for speakers with the new AirPlay 2 platform, which offers multi-room audio! Do Not Disturb While Driving can send automatic responses to let people know you’re driving when they try to contact you. There will also be an option to bypass the feature when you get urgent alerts. It won’t be enabled by default, but you will be prompted to activate it after your first journey with iOS 11. Apple is also introducing Do Not Disturb While Driving. As the name suggests, it prevents your iPhone from displaying notifications while you’re on the road. Turn-by-turn navigation is getting speed limits and lane guidance. We’re now moving onto Maps! iOS 11 will bring detailed floor plans for malls in major cities around the world. Floor plans will also be available for major airports, with support for more over time. Federighi is now demonstrating some of Siri’s suggestions. iOS 11’s Quick Type keyboard will learn new words based on your browsing habits. Memories have been improved, with support for portrait movies. iOS 11 will allow you to pull still images out of Live Photos, and add loop and “bounce” animations. There’s also a wonderful “long exposure” effect that merges Live Photo stills into one image. iOS 11’s lock screen and Notification Center have also been merged. You can swipe up while your device is locked to see all of your outstanding notifications — not just those that have appeared since you last locked your device. Federighi is now demonstrating big improvements to Control Center. We now have new sliders to adjust brightness and volume, and 3D Touch support that lets you access even more controls by pressing on your iPhone’s display. Apple is enhancing Live Photos so that we can finally trim animations and make other edits before sharing. iOS 11 is also bringing improved low-light performance to iPhone 7 Plus, while Apple’s Depth API is opening up to third-party developers, so you’ll be able to enjoy those dual cameras outside of Apple’s own Camera app. Apple is introducing new compression methods that will dramatically reduce the amount of storage our photos and videos consume without degrading quality. iOS users are now shooting over 1 trillion photos every year, Federighi says. Now onto the Camera app! Apple has also improved Siri’s prediction abilities. It now uses on-device learning to suggest new news topics, calendar appointments, and more based on the activities we carry out on our devices. With Siri translation, you’ll be able to translate words and phrases from English into Chinese, French, German, Italian, and Spanish. Siri is also getting a new visual interface, with multiple search results, and follow-up answers with just one tap. Siri is also getting big improvements in iOS 11. Thanks to deep learning, the virtual assistant is getting a new voice that’s even more natural. When you receive money, it will go onto an “Apple Pay cash card.” You’ll be able to use it to send money to others and to buy goods, or you can withdraw it to your bank account. It’s integrated right into Messages as an iMessage app, so sending cash will be as easy as sending a message. Apple Pay is getting person-to-person payments! Next: Apple Pay, the number 1 contactless payment service on mobile devices, Apple says. By the end of the year, it will be available in more than 50 percent of retailers in the U.S.
We’re starting with Messages, which boasts a redesigned app drawer in iOS 11. We’re also getting Messages in iCloud, which will sync all of your conversations to new iPhones, iPads, and iPod touches when you upgrade. Craig Federighi is back up to talk us through it. “It’s a big one!” he says. “Today, we’re going to take the world’s best and most advanced operating system and turn it up… to 11! !” Cook says. 86 percent of users are no using iOS 10, Cook says, while just 7 percent of Android users are running Nougat. Cook is back to talk iOS! A comparable workstation today would cost over $7,000, Apple says. iMac Pro will start at $4,999. It’s coming this December. iMac Pro supports up to two 5K displays for a total of 44 million pixels, two RAID arrays, a 1080p FaceTime camera, 4 Thunderbolt ports, support for VR, and lots more. This iMac sounds absolutely insane. I’m not looking forward to the price tag. It ships with either an 8-, 10-, or 18-core (!!) Intel Xeon processor, AMD Radeon Vega graphics with up to 22 teraflops of performance, up to 128GB of ECC RAM, and up to 4TB of 3GBps SSD. It’s not just the most powerful iMac; it’s the most powerful Mac ever made, with “workstation-class” performance with a new dual fan system that allows for much-improved internals. Apple is also introducing a new iMac for power users! It’s called the iMac Pro. It has the same design as the 27-inch iMac, but it comes in a “seriously badass” space gray finish. Holy crap! A sneak peek of the iMac Pro, in a space gray finish! MacBook and MacBook Pro are getting Kaby Lake processors and other speed bumps. All the new Macs ship today! Apple is introducing a new 4K iMac with a 21.5-inch display that will cost just $1,299. It is also adding a new 13-inch MacBook Pro that starts at $1,299. These VR demos always make me feel queasy and uneasy. Especially when Darth Vader appears. To boost the performance, Apple has added a 64GB RAM option. The new machines are reportedly 3x faster with graphics performance. Apple’s updating the iMac displays so they’re brighter. Intel Kaby Lake processors are being added inside. There’s also some new super-fast Fusion drives. Three USB-C connectors are being added to the back. Next up are some updates for the iMac! High Sierra will be available to developers today. The first public beta will be available later this June with the final version scheduled for release in the Fall. The Mac is about to become a legit Virtual Reality machine! Metal 2 will support VR. Apple’s also partnering with Steam to bring its VR games to the Mac. Metal has been updated to a new version called: Metal 2. It’s insanely fast and brings a 10x improvement on draw call throughput which will make graphics on the Mac way better. Metal is also being used for machine learning. It’s also going to be available for external graphics, letting you connect a GPU to your Mac video Thunderbolt. Apple File System is coming to macOS as the new default. Apple just brought it to the iPhone and iPad. It’s more secure and has a 64-bit architecture, moving the Mac into the modern world. The Photos app is getting some big enhancements. There’s a bunch of new editing tools like curves and selective color. All of your edits sync to your photo library so it works well with third-party apps like Photoshop. Apple’s also opening its Photos printing feature to third-parties so you have more options to see your prints in the physical world. Next up: Refinements to Mail. Search is now using Spotlight for better results, and there’s a split view that lets you see your inbox and a message you’re composing side-by-side when using fullscreen mode. Autoplay blocking and Intelligent Tracking Prevention coming to Safair … you can almost hear the advertisers (and publishers) weeping. But that’s gonna be drowned out by users whooping it up. Apple is also adding intelligent tracking prevention so the sites you visit can’t keep an eye on you. You can hear the advertisers — and the publishers — weeping. Safari is also getting autoplay blocking, so those pesky ads won’t bother you! High Sierra is “fully baked”? Craig Federighi brings the funny again. Get this guy a standup gig! Safari is world’s fastest desktop browser with High SIerra — it “smokes them all”! macOS 10.13 is called… High Sierra. “People are loving Sierra and we love it, too, so we wanted to spend this year perfecting it,” Federighi says. Craig Federighi is now up to talk the future of macOS. Cook is now back on stage to talk about “the heart and soul of Apple” — the Mac. watchOS 4 developer preview is available today, and will be rolled out to everyone for free this fall. Apple Watch is also getting a “safety light” feature, screen autorotate (finally! ), and lots more in watchOS 4. A new addition to the Workout app in watchOS 4 means you can enjoy music playlists that automatically start when you begin a new workout. You’ll also find handy playback controls within the Workout app itself, so you don’t have to leave to pause or switch tracks. Apple Watch will communicate with gym equipment now with watchOS 4. Devices that support the feature will let your watch connect to the gym’s machine so that it can share data. The feature will be rolling out this Fall. The Workout app has been revamped to be more powerful. You can now open the app and start a workout with one tap. There’s a new rest feature that pauses swimming workouts. High Intensity Interval Training is now natively supported in the Exercise app too. Activity notifications are more personalized in the new update. Apple Watch will now serve up personalized motivation notifications to keep you on track to beat your fitness goals. 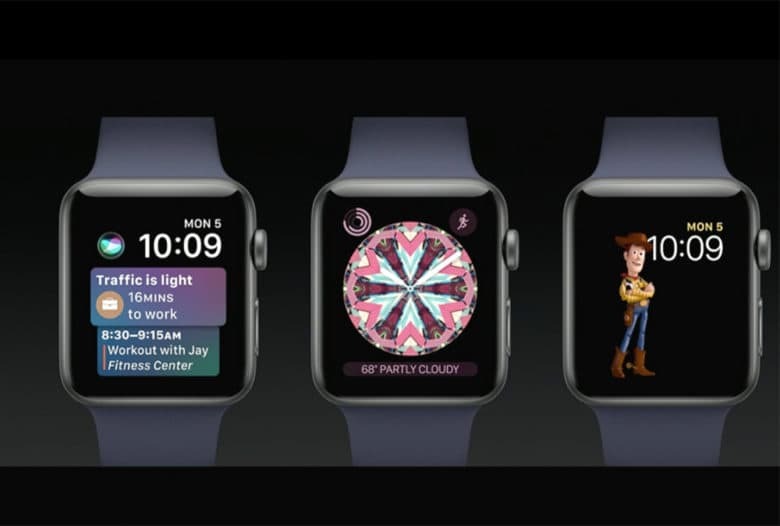 watchOS 4 comes with a new kaleidoscope watch face too. You can create different styles for the face based off pictures in your iPhone’s Camera Roll. There are also new Toy Story faces featuring Woody, Jessie and Buzz Lightyear. Kevin Lynch is up with all the watchOS 4 features. The update makes the watch more personal with new watch faces. Siri is becoming a more pro-active assistant and it powers a new watch faces that display important information throughout the day using machine learning. Apple Watch is up. It’s the #1 selling smartwatch says Cook. It’s designed to help you live a healthier life, so Apple is making a bunch of updates to watchOS. Thank god. Soon I can stop using my Roku 2 to watch Amazon Prime. Sounds like it’s going to be a lengthy one. Amazon Prime Video is finally coming to Apple TV! It’s about time. Cook says it should be available later this year, bringing Amazon’s original TV shows and movies to the Apple TV. There’s so much to show us this year that Cook isn’t bothering with stat updates. There will be 6 important announcements today. First up, tvOS. There’s still time for us to come out with our hit app Killian. One of the oldest devs is an 82-year-old lady from Japan, who published her first app on the App Store earlier this year. This 10 year-old coder is making me feel unaccomplished. But he’s been coding since he was six. Including one of the youngest, a 10-year-old from Australia, who has already published five apps on the App Store. 5,300 of those devs are at WWDC this year! Apple now has 16 million registered developers. 3 million were added last year alone. WWDC 2017 attendees come from 75 countries around the world. “This is going to be the best and biggest WWDC ever!” proclaims Tim. Based on the rumors, we’re in store for a lot of goodies. Tim Cook is on stage now. “I’m so glad that really can’t happen,” he says. The real-life FaceSwap reference was just disturbing. Probably Apple’s best intro in years! A hapless data center tech just unplugged iCloud’s servers and the world is thrown into chaos. It’s the APPocalypse. Oh my god! Where would we be without apps?!!? Here we go! Opening up with a video from one of Apple’s futuristic data centers. I’m guessing he’s asking his Siri speaker to start the keynote, but it just can’t understand him. The music is fading and the show is about to begin. Apple will probably open with a big video intro. The WWDC 2017 live feed is up! You can watch it on any iOS device or Mac. It’s on Apple TV in the Apple Events app. And there’s an option to stream on Windows 10. The keynote starts in 30 minutes and is expected to go over 2 hours. There’s a ton of stuff to cover just on the software side so this isn’t that surprising. Apple usually tries to keep the keynote between 90 and 120 minutes. Some of the press are having a really hard time accepting their new seats at the side of the auditorium, instead of being front and center. Others reporters are pretty ok with their new seats. If you want front row, the best option is to watch the live stream. Media members are finally being let in. Developers and Apple employees will be soon to follow. T-Minus 40 minutes to go. Apple accidentally revealed another big iOS 11 feature ahead of today’s keynote. The Feedback app on iOS mentions a new “Split View/Drag and Drop” option. This is one of our most wanted features for iOS 11, so it sounds like Apple has a lot of productivity features coming down the pipeline. Earlier today a placeholder for a new Files app was found in the App Store. The app isn’t available for download yet, but it says it requires iOS 11. Breakfast is served! Developers get an option of pastries, fruits, juices and other food items to choose from before feasting on all the new details of iOS 11 and macOS. Developers have been lined up outside the convention center for hours this morning. We’re about 1.5 hours away from showtime, but it looks like Apple is already starting to let some of the crowd wait inside before the main auditorium is open. Apple always gives WWDC attendees a jacket and other swag. This year’s might be the coolest yet. It’s a black denim jacket with a simple WWDC 17 logo above one of the pockets. A set of pins were also given out with each attendee getting a special pin of their home country’s flag. There are just under three hours to go until Apple execs take the stage. One of the key announcements from today has already been leaked though: A new File management app for iOS! This is exactly what we’ve been wishing for for years. For a full rundown on what to expect from today’s keynote, check out our wishlists for iOS 11, macOS 10.13 and watchOS 4. We’re also expecting to see a lot of new hardware by the end of today’s announcements. 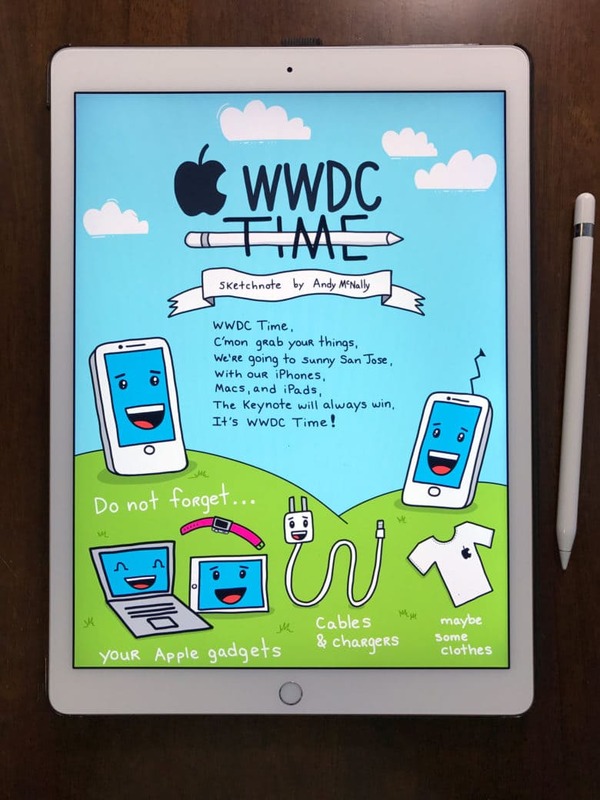 This year we’re doing something a little bit different and adding some Sketchnotes to our WWDC 2017 coverage. Our friend Andy McNally will be busting out wonderful drawings that encapsulate all the details of Apple’s announcements.